Strawberries are a healthy food to eat to lose weight, because there are 49 calories in one cup of strawberries. Chronic inflammation blocks the hormones involved in keeping you lean. Anti-inflammatory foods like strawberries help restore normal function to weight-reducing hormones. Anthocyanins actually increase the body’s production of a hormone called adiponectin, which stimulates your metabolish and suppresses your appetite. 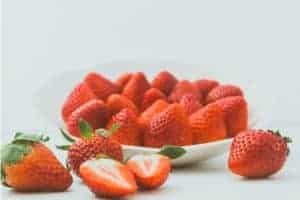 Strawberries are a tasty and healthy, low-calorie food. Then if they are freeze-dried, they also become a convenient and quick vegetarian food that promotes healthy weight loss! 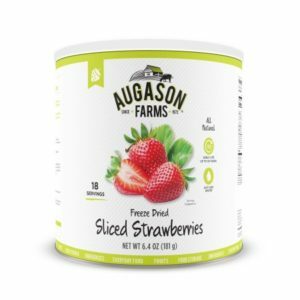 My favorite brand of freeze-dried strawberries is Augason from Walmart Supercenter. One cup of beans on average contain about 15 grams of protein. Beans are a most amazing food full of fiber, low-fat nutrition, and a budget-friendly protein. Then if your beans are freeze-dried, they also become a convenient and quick vegetarian food. 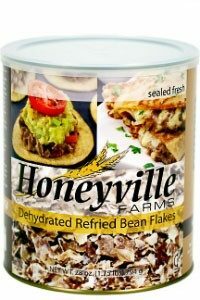 I absolutely love these quick and easy Honeyville #10 cans of freeze-dried pinto bean flakes. Just add 1 cup boiling water to 1/1/2 cups bean flakes. Cover and let sit for ten minutes. So quick and easy! There is no added fat or salt in these beans, they are just plain pinto bean flakes. I didn’t know how wonderful beans were until a couple of years ago. I have always had a sensitive digestive system so I stayed away from beans because I thought they caused gas. I have discovered they are actually one of the best foods for my digestive system because they are high in fiber and keep my blood sugar level more stable helping me to have more energy. Fyi, if I eat a healthy vegetarian diet, beans don’t give me gas. Freeze dried strawberries and pinto bean flakes are wonderful quick vegetarian food promoting healthy weight loss. Nice article! These all foods are rich source of vitamins and minerals which can be helpful to reduce weight. I like this article so much. Thanks and keep sharing. Lisa, Thank you for your comment.